It’s been seven years since a book on ministry from an Australian publisher took the evangelical world by storm. The success of The Trellis and the Vine: The Ministry Mind-Shift that Changes Everything (2009) surprised authors Colin Marshall (CEO of Vinegrowers ministry) and Tony Payne (CEO of of Matthias Media), who described it (with typical Aussie humility) “as an unexciting little book that consisted mostly of the blindingly obvious” (14). As is often the case, the “blindingly obvious” is where we most need clarity, especially when it comes to a biblical vision of ministry and discipleship. As the title suggests, The Trellis and the Vine is built on a metaphor: the “vine” representing spiritual growth by Word-centered disciple-making activities (teaching, training, prayer, one-to-one Bible reading), and the “trellis” representing the structural side of ministry (administration, organization, running programs, and so on). Churches need to structure their ministry around growing people, not programs, and letting trellis work support, not overtake, vine work. The initial success of The Trellis and the Vine sparked countless conversations and caused many to rethink their approach to ministry. It also unearthed serious struggles. Though many were gripped by the book’s compelling, biblical vision for disciple-making communities, they had trouble actually changing their church’s culture. A new sermon series or one-to-one Bible reading campaign isn’t enough to “change everything” (in the words of the subtitle). Without a more comprehensive and strategic plan to foster the right trellis dynamics for vine growth, changing a church culture is like “trying to turn around an ocean liner with a few strokes of an oar” (30). 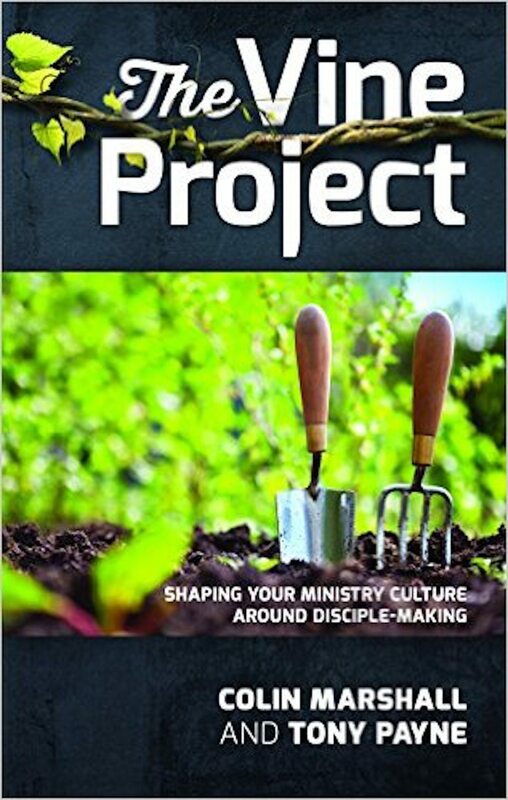 Marshall and Payne’s newly published sequel, The Vine Project: Shaping Your Ministry Culture Around Disciple-Making, is their roadmap toward a comprehensive and strategic plan that will help slowly turn the ship toward a culture of disciple-making disciples. Changing culture begins by changing deeply held convictions that underpin culture and your activities, practices, and structures that express those beliefs (32). Naturally, phase one (“Sharpen Your Convictions”) presents a theology of the why, what, how, who, and where of making disciples (or, as the authors call it, “learning Christ”). It lays a compelling and biblical foundation to build on in the next four phases. The 100 pages of phase one should be required reading for every Christian because of the simple yet glorious vision of discipleship founded on the four P’s of Ministry: (1) proclamation of the Word in multiple ways, (2) prayerful dependence on the Spirit, (3) people as God’s fellow workers, and (4) perseverance in the task (83). Phase two briefly seeks to sow these biblical convictions of discipleship into the heart of the reader to reform his or her personal culture. Leaders must exemplify the change they seek to foster. Matthias Media. 355 pages. $19.99. Phase three—on “loving, honest evaluation”—strategically guides leaders in how to do a whole-church disciple-making audit to understand current dynamics and diagnose roadblocks. This is where the hard work of implementing The Vine Project for culture change begins. Phase four (“Innovate and Implement”) is a detailed and immensely practical phase composing about a third of the book’s 340 pages. This section will strategically lay out a plan to slowly rebuild what phase three deconstructed, and will likely prove to be the book’s most helpful and heavily referenced portion as leaders seek to refine their Sunday gatherings, think through pathways for disciple growth (the four E’s of engage, evangelize, establish, equip), and change how they communicate. The approach for change is both top-down (ensuring the leadership team properly structures their activities and communication), and bottom up (working with lay leaders and individuals so they know how to adopt the 4P ministry mentality for making disciples). Phase five focuses on maintaining momentum and understanding the long-term dynamics of implementing The Vine Project, and teaches practical skills to keep your church moving toward a discipleship-based culture. The Vine Project isn’t a book to read through once and put back on the shelf; it’s a guide for a project, a self-described roadmap for a journey toward a healthier disciple-making culture. Building on their biblical compelling theology of discipleship, Marshall and Payne deftly apply business-world wisdom on changing organizational culture to the ministry context. Pastors and leaders will value the recommended resources, exercises, discussion questions, and insightful interviews with ministry leaders who have seen progress in their ministries. The Vine Project sharpens, clarifies, and builds on the principles of The Trellis and the Vine in a cohesive way aimed at implementation. It’s one sequel you don’t need to have read the original to appreciate. The pattern of Scripture is often the slow, hard, and messy road. Reading and implementing The Vine Project will remind you that God meets us on that hard and messy road when we, as God’s people, prayerfully and patiently proclaim his good Word to others. Kevin Halloran serves with Leadership Resources, an organization that equips pastors worldwide in expositional preaching, and is a member at The Orchard EFC in Arlington Heights, Illinios, where he helps lead the Spanish ministry. Kevin blogs weekly at KevinHalloran.net. You can follow him on Twitter.